Allison Neubauer is IISG’s Great Lakes education intern working this summer with Kristin TePas, our community outreach specialist and a liaison to the U.S. EPA Great Lakes National Program Office. 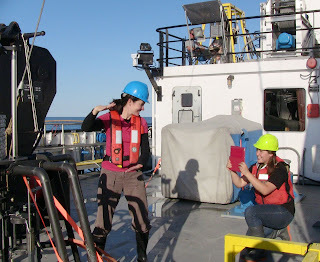 Both Allison and Kristin have been on Lake Ontario onboard the U.S. EPA R/V Lake Guardian this week. 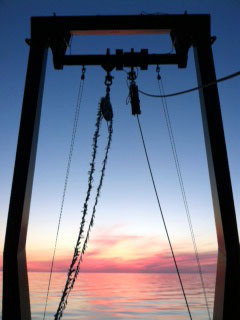 Working aboard the Lake Guardian on Lake Ontario this week has been a blast! Interacting with the scientists and crew on the ship has been very fun and insightful. I even had the chance to lend a hand with some of Clarkson University’s contaminant surveillance sampling yesterday evening- so cool! Tonight I’ll be helping pick out mysids (small, shrimp-like crustaceans) from zooplankton net samples. In this first photo, Clarkson University’s Tom Holsen is dumping sediment from Lake Ontario into the elutriation table (a device that helps scientists rinse organisms out of the mud so that they can be more easily collected). Here, Kristin (right) and I are rinsing the collected organisms into a sample bottle. My main focus has been working with Kristin to develop educational outreach materials to engage students and the general public in Great Lakes exploration and broaden their understanding of Great Lakes health. A crucial component in this quest has involved testing several methods of video casting from the ship with some very patient coworkers, friends and family back on shore. Our goal is to find a setup that would allow teachers and students in their classrooms to connect with the ship to see real-time research in action. 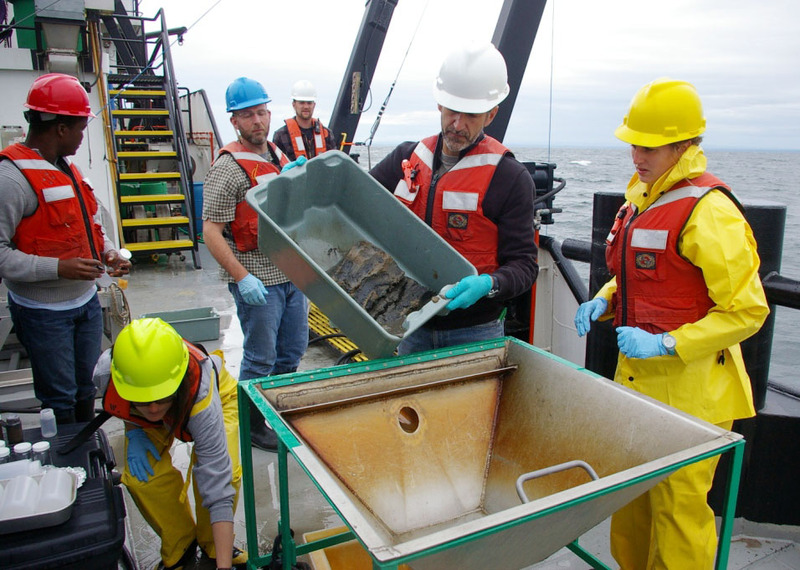 Scientists would be able to explain the background behind their research, show live footage of sampling equipment and processes, and then field questions sparked in the curious minds of students. After many trials and tweaks early on in the cruise, we finally found a successful setup and tested it with a fourth grade class in Detroit, Michigan this afternoon! It was awesome to hear how excited the students were to see the ship and learn about work and life onboard, as well as have their questions answered by U.S. EPA and Clarkson researchers and Guardian crew. I’m videocasting in this photo as Beth Hinchey Malloy, U.S. EPA scientist, (left) talks to the students from Detroit. Beth is explaining how the multi-corer works, using terminology that would resonate with 4th graders. 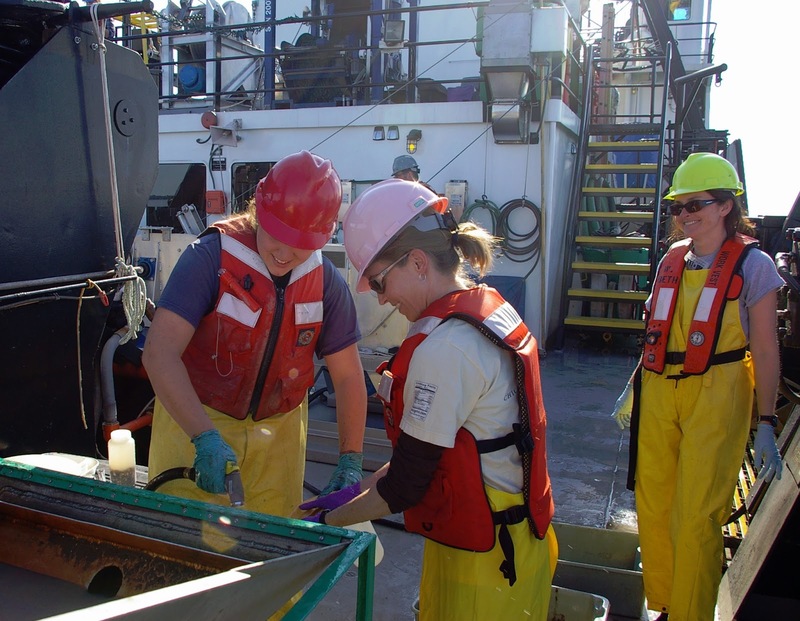 Along with testing and conducting video casts, I was really excited to interview some of the crew and scientists onboard about how they got into their field of work and what they do in their position. 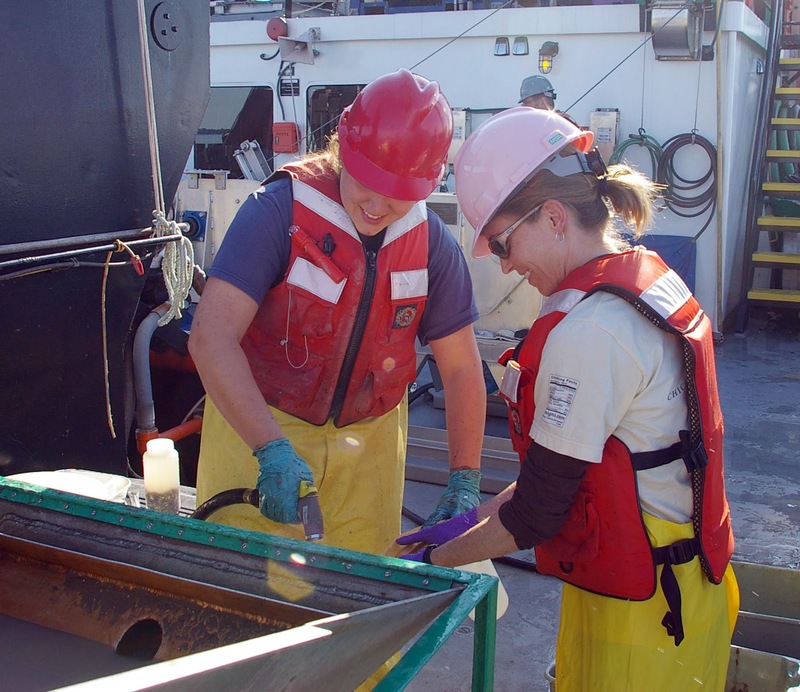 These interviews were recorded and will be an excellent resource for students to learn about science and nautical careers that are available, with the inside scoop from people who know the ins-and-outs! 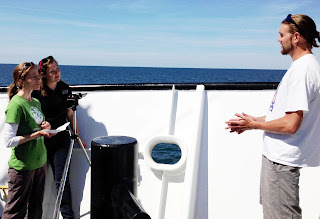 In this photo, Kristin and I are filming an interview with Max, a Lake Guardian marine technician. So many awesome things are happening aboard the Lake Guardian, and I am really looking forward to finding other interesting and unique ways to share it all with folks back onshore.